Upcoming Class(es): Please check our calendar for upcoming dates. To register, contact us at arcatcalhs@gmail.com . We offer courses at discounted prices that are considerably cheaper than the Bay Area Red Cross Chapter's rates. A class for certification in CPR/First-Aid/Automated External Defibrillator (AED) is $40 for ARC @ Cal members and $50 for non-members. Classes will be held on the UC Berkeley campus. CPR Training courses will teach life-saving skills to better prepare you for emergencies. We take requests for group certification, and take individuals when space permits. Join our listserve to be informed of trainings and space for individuals in the future. Participants will receive an American Red Cross certificate for adult CPR (valid for 2 years) upon successful completion of this course. 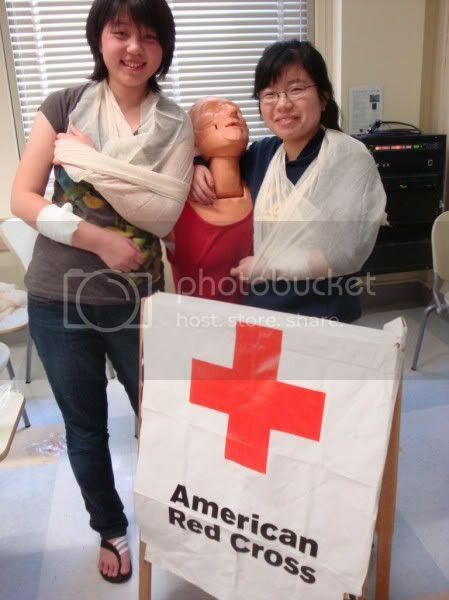 Participants will receive an American Red Cross certificate for First Aid (valid for 2 years) upon successful completion of this course.